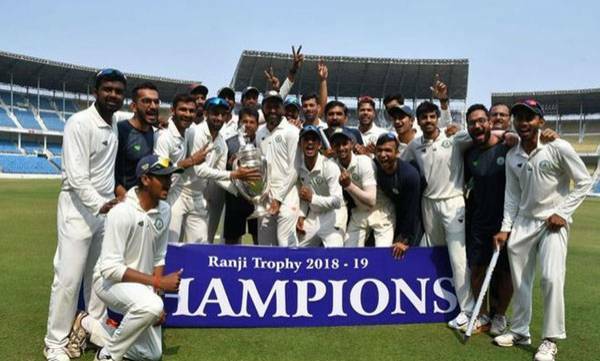 Nagpur : Vidarbha lifted their second successive Ranji Trophy title with a comfortable 78-run win over Saurashtra in the final, proving that their maiden triumph last year was no "fluke". Vidarbha needed five wickets to defend their title while Saurashtra, in a chase of 206, were left a mountain to climb after a top-order collapse on Wednesday. They required 148 runs for their maiden title on the fifth and final day at the VCA stadium. "Everyone thought it was a fluke when we won last year and we were under pressure to retain the title. But our focus was process, we never bothered about reputation," Vidarbha's talismanic coach Chandrakant Pandit said. The fiercely fought final swung early on but Vidarbha went into the final day with a tight hold on the proceedings and bundled out the visitors for 127 with more than two sessions to spare. Overnight batsmen Vishvaraj Jadeja (52) and Kamlesh Makvana (14) batted resolutely for the first hour but once the partnership was broken, the end was inevitable for Saurashtra. Man of the match left-arm spinner Aditya Sarwate claimed three of the five wickets that fell on Thursday, to end with career-best match figures of 11/57. He took six for 59 in the second innings.